Just these last two weeks I hit a wall, fell off the wagon, lost my way. Usually I am the Energizer Bunny of business, churning out blog posts, working for my clients and generally being a work-a-holic. Then we decided to move and the wheels fell off! I had to get a 4 bedroom home with 3 kids, 3 dogs, 3 cats, a mother-in-law, husband, fish and hamster ready to put on the market. Now, I could be one of those people who list as is and hope for the best but NO! I am an overachiever so we painted the front porch, stained the deck, painted rooms and generally made our home ship shape to sell. But that came at a cost of time. And the time that went was my writing and working time. Now, I did save time to do great work for my clients, but I couldn’t get to my work which is much less deadline based. So while I was off track I decided to listen to some interesting books on tape to while away the work time. I “read” one especially good book about the entrepreneurial life, Big Magic by Elizabeth Gilbert. Now Ms. Gilbert is also the author of Eat, Pray, Love which I understand is also a nice (and considerably more popular book than Big Magic) but not exactly my cup of tea. I am more of a non-fiction type of gal and so I dug into this with a tiny bit of trepidation. Come to find out I LOVED everything about her book, but especially the bit where she talked (very briefly) about curiosity. Functionally what she says is that you can get out of a slump by being curious about something, or really anything. What does that mean? Say you are a big time marketing nerd like me and you get into a slump. Just trying to get back into the grind using willpower and gumption alone will probably not get you too far. Slumps happen because you have gotten stagnant or unhappy. 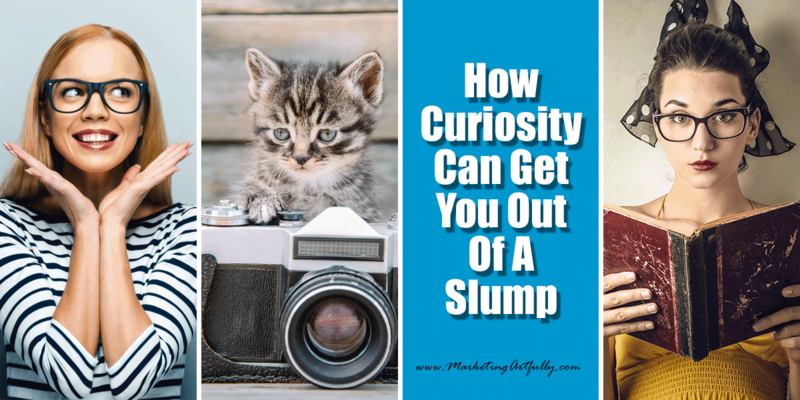 So how can curiosity get you out of a slump? By rekindling your creativity. Sort of like when those little embers are burning on your fire starter and you gently blow across them to get a real flame to spark. You are functionally using interest in something new or different to firestart your stalled enthusiasm. big magic is a promoted link, I recommend it because I ADORE this book! While I was writing this I got a little curious about curiosity (very meta). Einstein, one of my heroes, said, I have no special talent. I am only passionately curious. So some of the greatest thinkers of our time on planet earth think curiosity was their most important asset, how can I not think that it will help me out of a little slump? One of the things that I have battled the most in my life and business is the inability to sit comfortably in the little box that people think should be my home. “Oh you have Realtor clients, you should work with Realtors”. “Yes, you HAVE to have a niche, just one, and do that every day for the rest of your life”. Now, I am definitely not comparing my creativity about marketing to these amazing feats, but what if curiosity is not a curse but a blessing? What if, by being curious I can get back on track and start working again. They say, what you are doing now cannot get you to where you want to go and I believe that deeply at some level. If you peak at age 24 or 30 or even 50 and then spend the rest of your life just regurgitating the things that you are known for, man that would be a sad and futile existence. So instead I choose to be curious and learn new things and talk about stuff that makes me happy and hopefully helps some other people along the way. Elizabeth Gilbert’s Curious Thing – So Liz, can I call her Liz?, Liz said that she got over her slump by gardening. From planting seeds, she moved to researching origins of plants, to talking to people about plants, finally to traveling the world and writing a novel. This all started because she was stuck and couldn’t think of anything to write. My Curious Thing – I am really focused on Ecommerce and selling both my items and potentially reclaimed or vintage pieces. Right now I have an Etsy store and a Shopify store, but I am thinking about doing an Ebay store or perhaps an Amazon store. The idea of being able to make and collect things that I love and turn them into money is really a draw for me! Honestly, the only thing that makes me okay with all this is that one of my favorites (Gary Vaynerchuk) is fascinated with the pure commerce of Ebay too. Amazon Ebooks – I love that I can read almost anything online and research topics that I could never have found out about before even 10 years ago. YouTube – Holy heck batman, there is great information on YouTube about any topic that you are interested in. YES it is a rabbit trail of videos, but if you are just staying curious, there is no harm in watching a million unrelated videos until you get your mojo back. I had to jump in here and say something. There is a huge pushback against “wasting time” or learning about something that doesn’t have relevance in your life (yet). People will mock you for wanting to know about trains or germs or bees, ignore them. 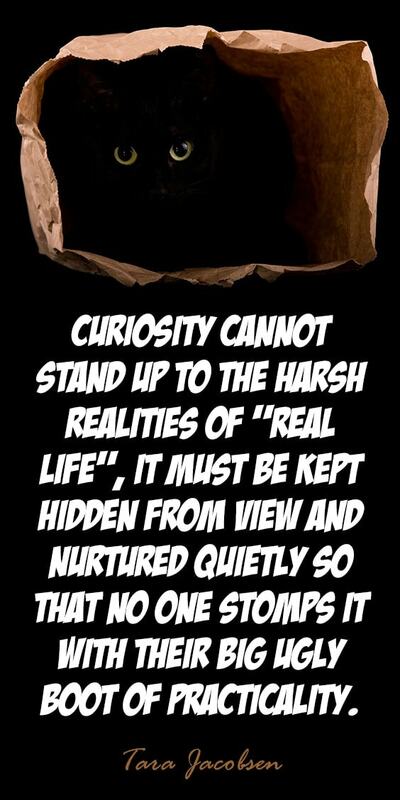 Curiosity cannot stand up to the harsh realities of “real life”, it must be kept hidden from view and nurtured quietly so that no one stomps it with their big ugly boot of practicality. Internet Searches – I love the internet and blog posts. I like knowing what other people think and how their minds work. I know, blogs are dead and we should all be on Facebook 24/7 watching what our friends are doing, but I like the quietness of reading about someone else’s thoughts. Masterminds – I have gotten some of my best ideas and advice by meeting with people who know me and love me over time. I love meeting with my “peeps” who have been with me over time and can call me on my bs and remind me that I really am cool and interesting too! Podcasts – Podcasts are amazing ways to learn about any industry that you are interested in! I listen to a great podcast Food Blogger Pro even though I don’t do food blogging. I simply take out the pieces that are relevant to me and ignore the food bits! I also listen to ones that are relevant, like the Etsy Conversations Podcast where the host, Ijeoma, talks to Etsy sellers about what they are doing that works and what doesn’t work. There is a wealth of free knowledge on podcasts these days! Thank goodness I am over my slump! I have produced a blog post I am proud of and can now get back on that horse and start writing daily. What about you? If you are this far down this article you probably are in a slump of some kind. What do you find interesting that your curiosity could learn more about that might jumpstart YOUR creativity?